Machine learning has been used for years to offer image recognition, spam detection, natural speech comprehension, product recommendations, and medical diagnoses. Today, machine learning algorithms can help us enhance cybersecurity, ensure public safety, and improve medical outcomes. Machine learning systems can also make customer service better and automobiles safer. When I started experimenting with machine learning, I wanted to come up with an application that would solve a real-world problem but would not be too complicated to implement. I also wanted to practice working with regression algorithms. So I started looking for a problem worth solving. Here’s what I came up with. If you’re going to sell a house, you need to know what price tag to put on it. And a computer algorithm can give you an accurate estimate! In this article, I’ll show you how I wrote a regression algorithm to predict home prices. Put simply, regression is a machine learning tool that helps you make predictions by learning – from the existing statistical data – the relationships between your target parameter and a set of other parameters. According to this definition, a house’s price depends on parameters such as the number of bedrooms, living area, location, etc. If we apply artificial learning to these parameters we can calculate house valuations in a given geographical area. The idea of regression is pretty simple: given enough data, you can observe the relationship between your target parameter (the output) and other parameters (the input), and then apply this relationship function to real observed data. We can calculate these coefficients (k0 and k1) using regression. Let’s assume we have 1000 known house prices in a given area. Using a learning technique, we can find a set of coefficient values. Once found, we can plug in different area values to predict the resulting price. But there is always a deviation, or difference between a predicted value and an actual value. If we have 1000 observations, then we can calculate the total deviation of all items by summing the deviations for each k0 and k1 combination. Regression takes every possible value for k0 and k1 and minimizes the total deviation; this is the idea of regression in a nutshell. But in real life, there are other challenges you need to deal with. House prices obviously depend on multiple parameters, and there is no clear linear relationship between all of these parameters. 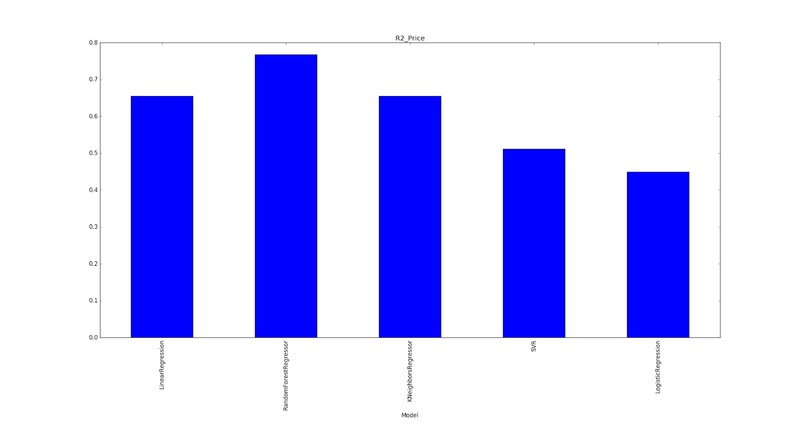 Now I’m going to tell you how I used regression algorithms to predict house price for my pet project. The first step for any kind of machine learning analysis is gathering the data – which must be valid. If you can’t guarantee the validity of your data, then there’s no point analyzing it. You need to pay attention to the source you take your data from. For my purposes, I’ve relied on a database from one of the largest real-estate portals in the Netherlands. Since the real estate market in the Netherlands is strictly regulated, I didn’t have to check its validity. Initially I had to do some data mining because the required data were available in various formats across multiple sources. In most real-world projects you’ll have to do some data mining as well. We won’t discuss data mining here, however, as it’s not really relevant to our topic. For the purpose of this article, let’s imagine that all the real-estate data I found were in the format shown below. I worked on the assumption that these are all measurable data that affect a home’s price. Of course, there may be more parameters that matter as well, such as house condition and location. But these parameters are more subjective and almost impossible to measure, so I ignored them. Now you need to check for strong correlations among given parameters. If there are, then remove one of the parameters. In my dataset there were no strong correlations among values. Outliers are observation points that are distant from other observations. For example, in my data there was one house with an area of 50 square meters for a price of $500K. Such houses may exist on the market for various reasons, but they are not statistically meaningful. I want to make a price estimate based on the market average, and so I won’t take such outliers into account. After that you will have non-outlier observations only. Now it’s time to start regression analysis. There’s more than one way to do regression analysis. What we’re looking for is the best prediction accuracy given our data. But how can we check accuracy? A common way is to calculate a so-called r^2 score which is basically a squared difference between an actual and a predicted value. It’s important to remember that if we use that same dataset for learning and checking our accuracy, our model may overfit. This means it will show excellent accuracy on a given dataset but will completely fail when given new data. A common approach to solve this problem is to split the original dataset into two parts and then use one for learning and another for testing. This way we will simulate new data for our learning model, and if there is an overfit, we can spot it. As you can see, the RandomForest regressor showed the best accuracy, so we decided to use this algorithm for production. Price prediction in production works pretty much the same as in our test code except there’s no need to calculate r^2 and switch models anymore. At this point, we can offer fair price predictions. We can compare the actual price of a house with our predicted price and observe the deviation. Take a look at my house price prediction project. I’ve sorted the houses I analyzed from undervalued to overvalued. This tool only ranks homes in the Netherlands. Naturally, my house price prediction algorithm isn’t 100% accurate. But for me it’s acceptable because my initial goal was to create some kind of custom ranking to reduce the amount of manual work for people who consider buying or selling a house and want to compare prices on the market.